Do you know what sedition means? Now, do you know what s[edition] is? Sedition, as the internet informs me, is the criminal act of saying, writing or doing something that encourages disobedience towards the institutional status quo. S[edition], on the other hand, is a few years’ old enterprise coupling together the digital revolution of the last decades and the contemporary art market, building a digital art platform truly fitting for our times. The brainchild of art dealer and entrepreneur Harry Blain and former Saatchi Online CEO Robert L. Norton, s[edition] was hatching since the early 1990s to come to fruition in 2011 with the promise to “turn screen into art”. Accumulating some 60,000 signed up members in just two years, s[edition]’s art collection can be readily enjoyed in all its pixelated, high resolution glory in any tablet, smartphone and flat-screen TV from prices starting at approximately 5£ to 1000£. The “digital limited editions”, of what initially was pre-existing art works and nowadays even exclusively created pieces, can only be displayed, not reproduced on paper; saved on the collector’s individual profile on the website’s server, not downloaded; and are limited to roughly 10,000 copies certified for resale. But to what extent is s[edition] a sedition? After the ready-mades of art provocateur Marcel Duchamp, already a century old now, that brought traditional art theory to its knees, the attempt of defining what art is, nowadays proves, at best, a futile and unnerving self-denial strategy of idealistic art historians in the making; people like me. New art forms and novel approaches to art production arise and take hold in the time it takes to shake a spray bottle up and down for the paint to mix. S[edition] weaves a new medium altogether; a new art; a whole new universe, if you will, for art to be made, marketed and assessed. An art that, at that, is also made differently than how it used to be since its inception. Art works like these, one can argue, are twice removed from art you can see on gallery walls; they exist as several copies of the same thing and they are also not even tangible. People like to say that traditions die hard, but this feels different; tradition here is executed. I am not denying that the reassessment of tradition, even its cold-blooded execution, can be a promising move. Sure, the digital revolution has drawn the art world out of tis shell and encouraged its diversification but not everything in actual need of reform has been addressed here. There is no denying that greater fame or infamy can be earned by artists; each can assure a previously unimagined level of exposure through various, often free, social media and internet platforms but the art world of today is still avoiding becoming truly social, truly open. S[edition]’s self-assured innovation in providing otherwise prohibitively expensive art in more affordable -not exactly similar however, one is compelled to note- editions, is in my opinion, if not misleading, self-incriminating. The website holds in its digital vaults names like Damien Hirst, Tracey Emin and Shepard Fairey, among others. Most of these names tend to have an already reserved seat in the round table of the UK’s contemporary art world, with an already proven, time and again, marketability. Isn’t the selection of such names a covert admission, not on purpose of course, of just how astronomically, almost ridiculously expensive these artists’ work is in the first place? If there is a reason to sell it cheaper, it is too expensive. Why not lower the price in general and hold an intervention for the art world’s obsessive and hypocritical cupidity? In s[edition]’s universe not only is money being fed into the art market for the original, tangible, ludicrously expensive and status laden work of an artist, but along with that, undoubtedly less but still very real, more money is being exchanged in the name of a cheaper, digital, copied work. This reality, surely, doesn’t seem to be helping the lay art lover nearly as much as it helps the art market’s money vaults, virtual and real; the already famous artists and their dealers. It is estimated that there currently are more than 300 hundred online art platforms. No matter that, only a 3% of artists exhibit in galleries and even less are living half as well as Damien Hirst does. S[edition], despite its intentions, cannot and does not aid the developing artists in the real world. It perpetuates the exclusive character ascribed to the art world by the wealthy and leisurely 1%. Their model undermines the right for freely accessible art, in many ways different from ‘cheaply accessible art’, even though at first glance it may not seem to be so. Then again, that’s the traditional role of auction houses and most galleries anyway. My point is simply that their mission statement does not propose a sedition in any real or essential way. Growing up within and around the walls of free mammoth art institutions and humbler galleries I firmly believe art should be public. S[edition] takes the contemporary art market as it is, highly individualized and elitist, and that is of course their right, as much as it is the right of any individual collector to hoard Impressionist and Surrealist paintings in their loft houses and vacation homes. My belief is that we should be moving away from that kind of mode of appreciating and facilitating art; outgrowing it, not justifying it with the creation of more outlets of such kind. I may very well be too idealistic. But that is my right too. What further troubles me about s[edition] is their firm and irrevocable hold on a monopoly. With the slight exception of “StillReel”, a subscription based Australian start-up for digital art streaming – something of a “quality Netfilx”- I am not aware of the existence of any direct competitors out there for them. Now, how fair is that? But, hey, we’ve got a free economy, nothing is really fair. I won’t even go into the rabbit hole that is the experience of a tangible, textured, framed work of art on a gallery wall around which you can circle, crouch in front of, touch with your breath and walk away from, versus what is, in reality in great risk of being simply called, a screensaver. In an era when e-books are fighting it out with paper prints, vinyls and cds with Spotify and pirate downloads, all of this seems to be a “very logical extension of the art world tradition”, as s[edition] Director Rory Blain says. Indeed, it sincerely is. But the questions, loopholes, and controversies are way too many. I can only conclude with what is an exclusively personal opinion; I wasn’t taught to “do art” like this either at university or in life. Art and “Madness”: Fact or Fabrication? The idea of the artist as inherently troubled is far from new. As far back in time as classical antiquity, a perceived link has existed between artistic ability and what the Ancient Greeks crudely deemed “madness” . This association, which has been sustained throughout history by notorious examples including Caravaggio, Vincent Van Gogh and Peter Howson, has functioned to provide a dubious explanation for that inimitable quality possessed by great artists. And in fact, the stigma of “madness” is not only limited to practitioners of the visual arts; the entire doctrine of the arts is often tarred with the same brush. But how has this theory come about, and how far can it be considered a genuine anomaly or simply the product of romantic fabrication? The theory appears to be supported by copious examples. Some of the world’s greatest artists, musicians and writers have experienced a form of mental instability. 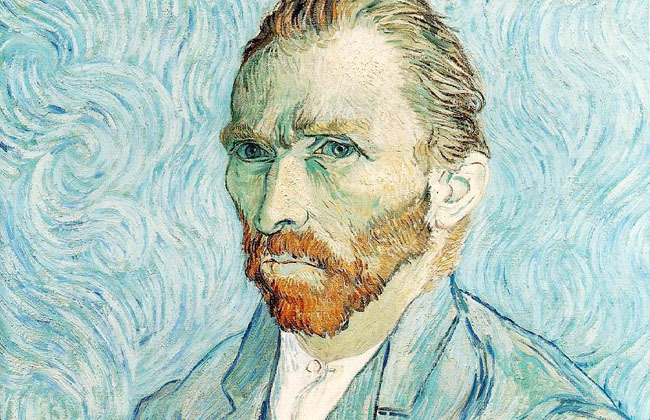 Van Gogh famously ate paint and cut off his own ear, Caravaggio killed a man over a tennis match, Tchaikovsky was known to hold on to his head whilst conducting for fear that it might fall off… the list goes on. Historical example, therefore, would seem to imply some sort of correlation between psychological turmoil and creative prowess. Perhaps emotional anguish, short of debilitating clinical mental illness, actually provides fertile ground for artistic creativity; after all, creativity is surely stimulated by emotion, which is often experienced in the extreme by those suffering from mental illness. But even if “madness” is a stimulus for creativity, it is not sustained by creativity. Although a relatively new practice, art therapy has been shown to help many of those who suffer from mental illness by providing a means of psychological catharsis. The work of the Abstract Expressionists during the mid 20th century operates under the same theory; the canvases acting as a visual outlet for their innermost thoughts and feelings, preventing those feelings from becoming ultimately overwhelming. And it’s worth noting that most practitioners of the arts that have been considered mentally ill struggled creatively when the symptoms of their illnesses were at their most severe: Jackson Pollock, an alcoholic, created his famous “drip paintings” during a period of abstinence, Peter Howson found himself unable to paint during the filming of BBC documentary “The Madness of Peter Howson” due to acute depression, and Robert Schumann too was rendered void of creative output by an overwhelming bout of depression. And let’s not forget that there are also repercussions of making this association. Attributing creativity to something not only outside the artist’s control but also potentially crippling undermines both the artist’s skill and art itself by suggesting it to be the product of psychological malfunction. Much more seriously however, the concept trivializes and romanticizes mental illness. So what can be made of this alleged connection between art and so-called “madness”? It would seem that if there truly is a connection, it is not the one that has been sustained over the years. Perhaps a connection exists in that the two concepts must be close, but not quite touch; that the greatest level of creativity is achieved by accessing the subconscious on a deeper than average level, but in a way that is controlled and not overwhelming. Rather than going hand in hand, creativity and serious mental illness actually serve to inhibit one another. The greatest art, therefore, is both the product and perhaps the source of psychological balance, not bedlam. Street photography has changed beyond description in the past couple of decades. From the halcyon days of Bresson and Doisneau in Paris, roaming the city and capturing it’s people clearly and precisely in moments which have been crystallised forever. Photography itself has changed. 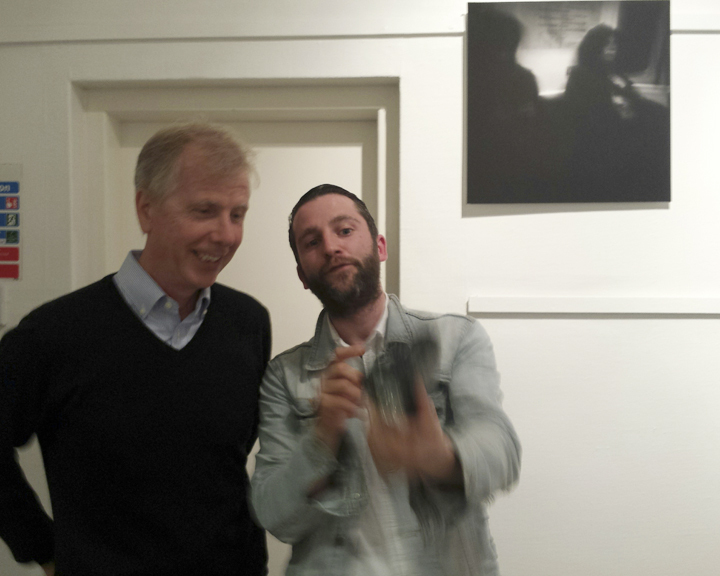 Hugh Hood & Donald John MacLean discuss the intricacies of MacLean’s trusty Holga. As digital technology took hold in the early part of the century people’s attitudes and understanding of the camera changed. No longer was photography something of a dark art, understood by only those few willing to put the time and effort into learning about chemicals and reactions while simultaneously investing relatively large amounts of money into equipment and consumables. Almost everyone now has access to a camera, from the smartphone to more easily accessible digital SLR’s and it has undoubtedly had an affect on the medium. Outside influences, ranging from media paranoia to knee-jerk government reactions have added to this change in the medium. The feeling that a photographer with nothing but genuine intentions to document a specific time, place or person is somehow a danger to society and must be treated with fear, anxiety or indeed scorn and anger is now commonplace. These issues affect the photographer’s approach as they look to stand out in a saturated world of imagery, but also to go unnoticed by those who seek to blame the photographer for a range of media driven fears. 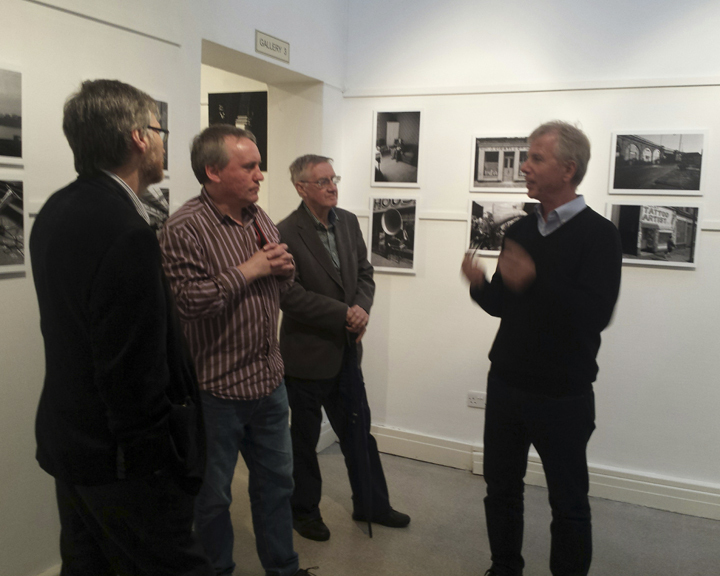 Hugh Hood speaks about his work. This change in street photography is presented in stark reality at The Lillie Art Gallery in Milngavie as Hugh Hood’s recently discovered images of Glasgow in the mid to late 70’s take their place on the walls next to Donald John MacLean’s shadowy, blurry representations of life in modern day Glasgow. Hood’s work follows the standards set by the greats of street photography in the 40’s and 50’s, people feature heavily, recognisably as the crystal clear reproduction of these rediscovered images takes the viewer to the heart of a Glasgow which was undergoing yet another massive change to it’s environment both socially and aesthetically. Hood captures a Glasgow which can be shocking to those unfamiliar with it’s past, a glasgow which in places looks like it has been the victim of a brutal war. Children play among derelict tenements, standing lonely against the horizon beside the rubble of it’s former neighbours. Women walk home with their shopping, behind them the construction of motorway’s and bridges take their toll on what was at that time a tight knit community at the heart of the city. Yet there is a happiness to Hood’s imagery, despite the hardships of the time people seem relaxed, friendly and willing to engage Hugh and his camera as they go about their daily business. Adults and children alike smile towards the lens as if predicting the air of nostalgia that will sweep through the minds of even those too young to remember the city at that time. Hugh Hood captures Glasgow as it is told to you by your parents and grandparents, a place where poverty was outdone by community, fear overcome by friendliness. Moving on from the main gallery and into the smaller, tighter space which houses Donald MacLean’s work and the atmosphere immediately changes. Suddenly things feel more oppressive, as if the smaller room has been designed to crush the airy, nostalgic feelings you walked in with. MacLean’s images are different from Hugh Hood’s, noticeably so. Each image, despite their blurry and shadowy appearance, strives for your attention causing you to take each one in in a glimpse, something almost comparable to a fast cut horror sequence. The only thing lacking is the screeching score to underpin them. After the initial rush of visual excitement wears off it becomes easier to concentrate on MacLean’s work, unconventional by both popular photographic standards and in street photography as a genre Donald’s imagery focuses on atmospherics in an almost abstract manner. Blurred faces and hooded, cloaked figures populate Donald’s streets with an increasingly ominous feeling in each frame. His approach, often shooting from the hip with a beaten and battered plastic Holga camera allows for the creation of a world which becomes the opposite of Hood’s Glasgow. Gone are the clear backdrops and engaging faces found in Hood’s work, replaced by shadows, light leaks and barely recognisable human features. 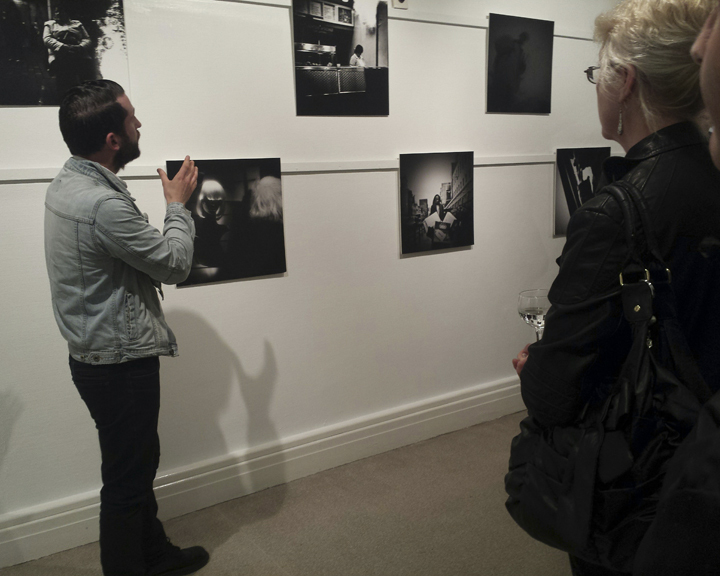 MacLean seeks to highlight the isolation and loneliness of the city dweller, almost as a direct consequence of the modern improvements which Hugh Hood’s images capture the beginning of. MacLean’s city is divided, on a societal as well as an individual level as people put up barriers between them and those around them. This is a Glasgow which has been created through fear and isolation an eerie city completely devoid of hope, a mockery of itself, a dark caricature of the city’s harsh, cruel personality. Both photographers are products of their time, the influence of the city itself is almost secondary to the entanglement between photography and modern society as a whole. While we can see Glasgow in Hood’s work it could easily be transferred to somewhere like Birmingham or Liverpool, cities which have a similar background to Glasgow while MacLean’s work in it’s style and essence could depict any city in the world, nowhere is devoid of the issues he addresses. ‘The Glasgow Miracle’ is a term that has been on the lips of critics and artists since at least 1996, when Swiss curator Hans-Ulrich Obrist first used it to describe Glasgow’s contemporary art scene. Despite the lack of a thriving art market, Glasgow has produced a number of highly successful and acclaimed artists, amongst whom are Turner prize winners Douglas Gordon, Martin Boyce, Susan Philipsz and Richard Wright. ‘The Glasgow Miracle’ is a contentious term – on the one hand, the word ‘miracle’ offended artists who felt that their success has been dismissed as a result of arbitrary forces rather than genuine hard work. ‘Miracle’ is, after all, a term denoting a one-off event; at the same time, even if short lived, it has influence over the generations to come. This contradiction ingrained in the word itself is present in the way it has been used ever since the conception of ‘The Glasgow Miracle’. Francis McKee, the current director of Centre for Contemporary Art in Glasgow, in an article printed in New York Times in 2012 argues that ‘Everyone has pretty much taken offence’ at the term. At the same time, the contentious term was treated as a springboard for a debate on the art scene in Glasgow, with McKee and Ross Sinclair heading a team of researchers whose goal was to catalogue the origins, history and international influence of Glasgow’s burgeoning art scene. ‘The Glasgow Miracle’ project aimed to sort through archives of the Third Eye Centre, a predecessor of the CCA. According to ‘the Glasgow Miracle’ blog, much of the responsibility for the reinvigoration of the art scene in the 1970s and 1980s can be attributed to the Third Eye Centre and its founder, Glaswegian playwright and pianist Tom McGrath. It was his incessant need for experimentation and pushing the boundaries that allowed many memorable events to take place, such as Billy Connolly’s performance or the development of video art through McGrath’s connection with the Rotterdam Arts Foundation. Other writers point to the environmental art course at Glasgow School of Art led by David Harding as the thing that sparked ‘the Glasgow Miracle’. Above all else, Glasgow’s burgeoning art scene as we know it now had been shaped by the permissive attitude that the government in the 1970s and 1980s had towards grass-roots movements such as Third Eye Centre. 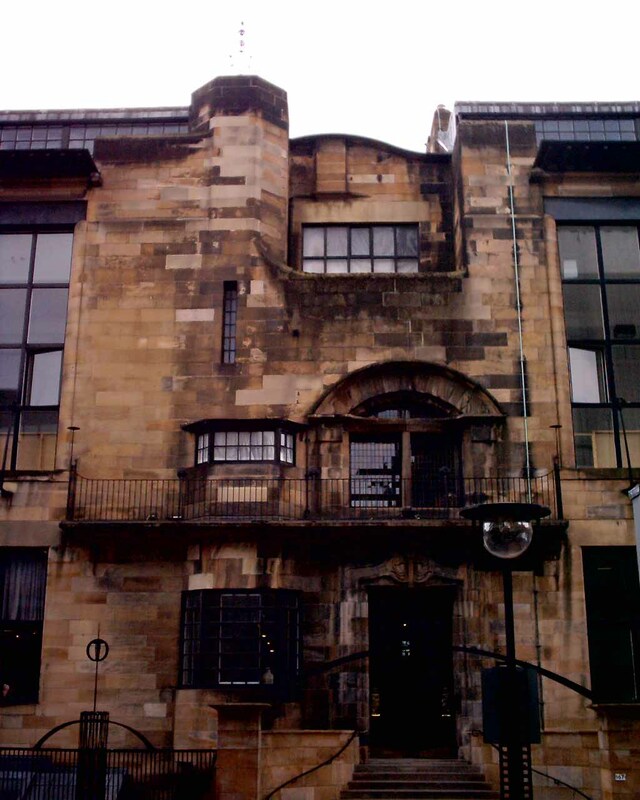 Vacant buildings scattered around the city were easily available to artists and activists, with the Arts and Humanities Research Council investing into the renaissance of art in Glasgow at the time. Nowadays, we see what a huge change has affected the government’s policy on art and art funding. One example is Govanhill Baths which the city council had attempted to close down in 2001, but which, due to the protests from the representatives of local communities and artists, reopened as a community centre. What appeared to be the norm in the 1970s and 1980s, today is treated as a miracle, ephemeral and irrational. However, the long string of names of Scottish artists associated with the Turner prize reads as a confirmation that miraculous things are still possible in Glasgow, which remains open to new possibilities and projects. It almost seems that the most surprising ‘miracle’ of all is the lack of contemporary art market in Scotland. Perhaps due to the tradition of shipbuilding and export of goods as the factors defining Glasgow in the eyes of the world, contemporary art is similarly ‘shipped off’ and sold to all the corners of the world, rather than adorning Scottish art galleries and private houses. Thus the term ‘the Glasgow miracle’ invariably points toward the commercial side of art; it’s a catchy phrase allowing the artists to advertise their works successfully (the Glasgow School of Art even offers a city walking tour, exploring the miracle and sights connected to it). ‘The Glasgow Miracle’ has been thoroughly deconstructed by critics and pieced back together to form a brand, advertising Glasgow as a tourist destination The term, with its commercial implications, seems to be nothing more than an eye-catching candy wrapper, concealing the amount of work that had been contributed to its production. It would be interesting to explore the impact of the term on the work of young generation of artists who grew up in the shadow of the famous Turner prize winners. One can only wonder what would happen if the newly opened Reid building carried a sign saying ‘The Glasgow Miracle’ instead of it’s colourful exclamation ‘Now Sing!’, designed by Glasgow-based Michael Stumpf.